If you could design a ministry what would it look like? Would it be feeding the hungry? Would you provide water purification? Would you distribute clothing? Give out medications? Work at a hospital? Organize events to raise money? Clean-up after a natural disaster? Build homes or shelters? Some of these ministries probably sound alright, some maybe even good, others horrible. Now, think of a ministry that would accomplish what Frederick Buechner describes as "your deep gladness and the world's deep hunger meet(ing)." I truly believe God calls us to what we enjoy. Ministry that leaves you feeling miserable is wrong and ineffective. So find what you enjoy and do it for the glory of God. Mom read the book "Little Women," to me as a child and I remember it well. Last night, the RVA high school did a theatrical production of Little women. Amelia and I went together. Before it began I warned her that Beth dies and that the actors were just "pretending and no one really died." Well, the play version turned out to be different than the story and Beth lived. So, at the end of the 3 hour production Amelia said, "Mom, why did you think Beth died?" Anyway, even though the play was not true to the book, it's fun to have opportunities to take Amelia to theater. Maybe I'll read her the book someday as well. Uplifted by honest people in this world.. 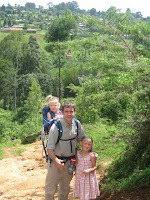 Completing our 2008 Tax Forms while in Kenya was an enormous task. Trying to compile all the needed signatures, forms, and receipts and then have them delivered to an accountant in the United States via family and unreliable internet was a cause of stress. The stress and uncertainly continued as we waited and waited for our refund to be deposited electronically into our checking account. April came and went and our refund and not been seen. May came and went and still we saw no sign of our refund. June came and still their was no sign of our refund. Of course we contacted our accountant and we're told the funds had been deposited in early May to our account. If the funds were deposited it was not our account. It was all an amazing blunder. A distant relative of Sara's with a similar first name (spelled Sarah), a similar middle name (just Elizabeth instead of Beth), obviously same last name Cichowski, and same birth year had received our rebate. This happened because her sister worked for this accountant some years back and they pulled her old bank records rather than using ours. Thankfully Sarah Elizabeth Cichowski called the IRS to say the refund was not hers after it had been deposited into her account. She also called her mom, who called my grandma, to find out what other Sara Cichowski's she knew. Then my grandma called my mom and well now we know the rest of the story. We truly are grateful for her honesty and integrity. As cute as our 2.5 year old daughter Meredith is I am convinced that her right thumb is a vector. A vector is a carrier that transmits a disease from one party to another. It starts with Meredith putting her Crocs in her mouth, picking up chameleons and grasshoppers, or eating food off the floor. Then we say Meredith "Stop!" Her right thumb immediately goes into her mouth. She has become a vector. She then proceeds to share your drink, put your spoon in her mouth to eat your cereal, or give you a slobbery kiss. Walllaaaa- The family is sick! Amelia and Meredith both woke-up screaming last night and ended-up in our bed. Malin went upstairs to sleep. As soon as Amelia woke-up she ran to get the tie and shirt she had made dad at school for Father's Day and presented it to him in bed. Meredith ran upstairs too because she also had a gift for daddy. 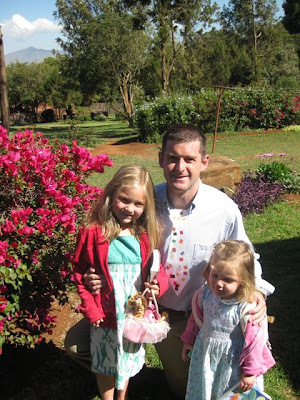 We went to Sunday School and church and then drove to Nairobi to go out for lunch. This was a white-knuckle trip for me. I'm not the best about backseat driving and the drivers around here are unpredictable. Nevertheless Malin kept the car on the left side of the road and did well even with donkeys, people, cars, and matatus (taxis) pulling in and out as they pleased. We actually ate Chinese food for lunch and ice cream and then headed back to Kijabe. It felt good to do things we would routinely do in the States: driving, go out to eat, treat the girls to ice cream, and celebrate Father's Day. I think these ordinary things become extraordinary encouragement and support when living so far away. It's not new, it's not red, it's not even all that fast, but this is now the Friess family car! This is a 1999 Toyota Corolla that was imported from Japan several years ago. Most imported cars (come in white) no choice. It is four wheel drive, has about 87,000 km, and has automatic transmission. 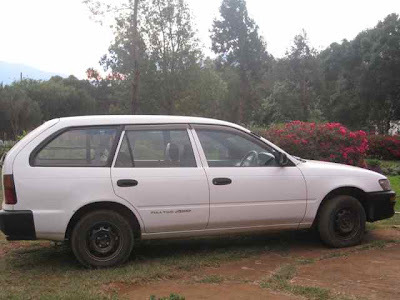 This car was transferred to us through our project account under Samaritan's Purse from the departing OB/Gyn physician leaving Kijabe. We took the keys yesterday...and I admit I felt like a 16 year old with the freedom of his first car. I put the window down, turned on some music, put the window down to wave at any passenger, and gassed us up! 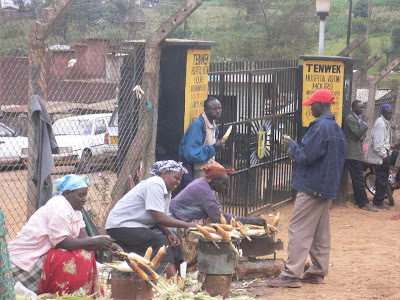 Driving in Kenya is always an adventure and usually proceeded with prayer. Having not driven any vehicle in the last 7 months we cautiously took a family drive. Driving on the left side of the road (think left turns-tight, and right turns-wide), avoiding goats, negotiating potholes, and staying out of the way of speeding Mutatu's (Kenyan Taxis) requires full attention. We feel thankful and energized by the new freedom this will give our family as the last 7 months we have been dependent on catching rides with others or hiring drivers. The girls seemed to enjoy our family drive. Amelia promptly fell asleep in the car. Meredith liked her car seat but was unaware that, "Daddy you can be our driver?" Many parents we know pray with their children at bedtime. I remember this tradition growing-up as well. We also pray with Amelia and Meredith right before bed. Meredith mostly repeats what we say, but will occasionally add "thank you for Amia (Amelia) " and "Help me be nice." Amelia is beginning to think independently about requests and needs. Last night her requests were "Help a family to really like our house and buy it. 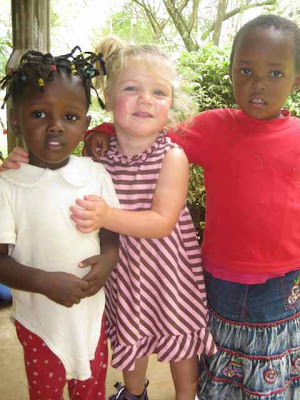 Help Claire's house helpers to be able to keep Diana (Roseline's orphaned daughter) and be able to purchase a bed for her. And please help there to be less scary noises tonight and for me not to be scared." I enjoy listening to her think of what needs there are around her and was impressed that she recognized her personal needs, her family's needs and the needs of those around her. This reminded me that I should also think of these basic categories as I pray and that there is much to learn from a child's faith. 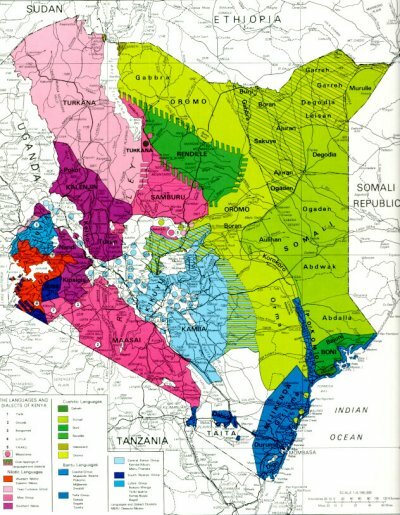 Tenwek Hospital where we served for the first seven months was home to the Kipsigis tribe (designated at the darker purple area on the map below the dotted line). We have just moved to Kijabe Hospital which is home to the Kikuyu tribe ( designated as light blue in color on the map). Amelia is pictured here in front of her new elementary school. 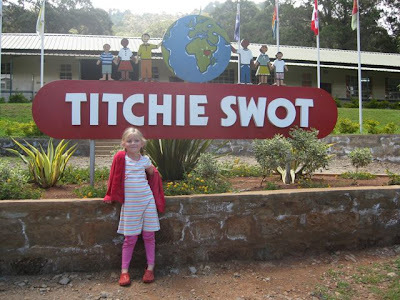 I have been told Titchie Swot is a british term for "little brat' but in an affectionate sort of way. Amelia attends morning kindergarden 5 days a week. She has a class size of 4 kids (3 girls and 1 boy). They are currently learning subtraction and about Queen Esther. She likes recess and snack time...but is still getting use to the 20 minute walk to school all "up, up, up" as Meredith says. Thanks to all who prayed for safe travel as we moved. We arrived at Kijabe around 4pm yesterday. Amelia and Meredith promptly started playing in the dirt and picking flowers. It is much greener then when we visited in Feb. We all walked Amelia to school this morning. The ascent up the hill took almost 25 minutes. At noon Malin picked Amelia up she commented that, "Although school is fun, and I made friends, I'm not sure it leaves me enough time to play at home." Well, we think she'll adjust! Malin's getting started tomorrow at the dental clinic. I will wait one more week. Our family's route to Tenwek Mission Hospital was circuitous and unexpected, but clearly God's fingerprints were all over our journey. We feel blessed to have spent 7 months at Tenwek and have been warmly welcomed by the Kipsigis community, the missionary community, our church, and the hospital. We are saddened to leave Tenwek, but happy to remain in Kenya. Today we said most of our goodbyes. At Bethesda Church our family was prayed for that "we are in the palm of God's Hand..and that our path's would be made straight." Amelia & Meredith had a going away girl's party with her friends here. They had Spaghetti and watched movies. Then woke up the next morning for pancakes. We had a family goodbye chili and bread party today. Tomorrow we will say goodbye to Janet & Rose who have been with us for the past 7 months. Their smiles show what a blessing their spirits have been. 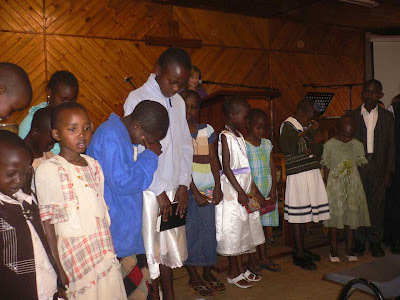 We also go excited to join the community at Kijabe and follow God's call to a new place. This map (from strangemaps.wordpress.com) lists the ratio of doctors per patients for countries of the world. Cuba leads the world (or at least those countries shown on this map) in the patients per doctor ratio. Other countries doing very well include the successor states to the communist bloc nations, which generally had good (and cheap) health care, and the developed (capitalist) nations in Europe and beyond. 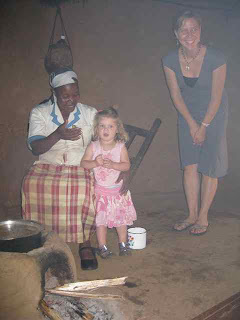 Rose (pictured in the chair with Meredith preparing Chai over the fire) invited us to her Shamba. Her house was only 45 minute walk away. 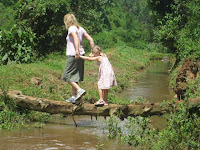 It was a nice walk with the family, and even after 6 months in Kenya some of the images still surprise me. We pass a rock quarry where men and women labor under the sun all day long using hammers to chip away at large rocks to make gravel to sell. 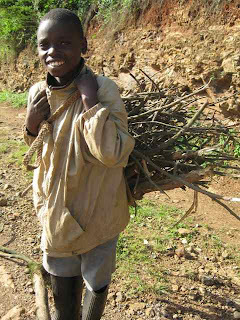 We see the boys such as this carrying backload full of sticks. We see the children so young (maybe just 4 or 5 years old) seemingly already herding a few goats. I see the 60 year old man carrying a 30 foot log up a steep hill, and grab and end to help. Arriving at the top of the hill I find a pile of 15 logs depicting how many times he has already made this journey. We arrive at Roses house. 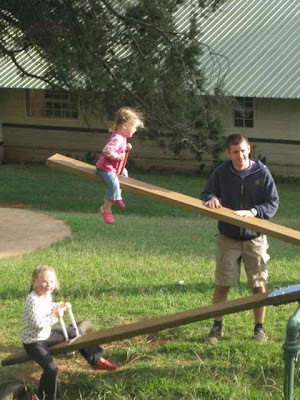 The acre of land she has is very steep and they try to feed all four of their kids from the rows of corn they grow. The kids play in the dirt, herd the cow, and chase the chickens..not a toy to be seen. Her eating room is simple; 4 benches around the periphery,6 chai cups, a water filter, and an old radio. Family all sleeps in one room behind the curtain separating the eating room. The cooking room (as you can see pictured) is so smoky we can barely stand long enough to take a picture. Rose's husband is a carpenter but there is not any work currently available. Perhaps the most humbling aspect of it all was Rose's wallpaper. Kenyan's often use magazines or newspapers to cover the walls of their sitting room. To see our trash (dental publications, OB/GYN journals, the Akron/Beacon Newspaper) as Rose's wallpaper was unexpected. We enjoyed the Chair & Mendazis she served us with her family. 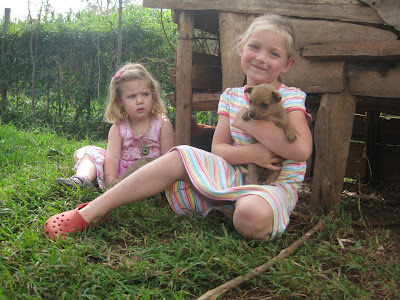 Amelia and Meredith wanted desperately to take home one of her two puppies. Do you want to play left handed? There is not much to do after the sun sets at Tenwek at 7:00 PM everyday, but I feel fortunate that Tenwek has a racquetball court. Visiting physicians come and go and frequently we get together to play racquetball. A neurosurgeon invited me to play racquetball last night. We played several games and I quickly found out that he was an amazing racquetball player. All his shots were low, accurate, and with power. Furthermore he was diving all over the court with no hesitation. He beat me easily all four games. I was not very happy. But it got worse. Then he proceeded to ask me something I never been asked in my life, "Do you mind if I play you left handed? I've been playing my daughter this way recently." I have never been asked that question before. I don't ever want to be asked that question again in my life. Usually, I am the person asking my opponent that question! What could I do, he had proven he could beat be right handed. "Sure," I replied. He switched his racquet to his left hand. We are all humbled at different times in our life and different ways. This was my moment. Oh yeah, did I mention this brain-surgeon's age, he is 62 years old. Well, we played two games my right hand against his left hand. I was determined not to be beaten by a Senior with his off hand. I won..humbled but with a fraction of my pride together. We still see many patients using herbal medications. Within 24 hours 2 patients came from the same district hospital with uterine ruptures (a rare, life threatening condition) Muruka found herbal medications inside one. Thinking these might be the cause we've tried to figure out what herb was used. But as Muruka says, "Take every tree, herb and shrub, multiply by 3 and that's how many remedies there are. 3 because you can use the leaves, bark or root to make the medication." I think God gave us many natural options for medicine and it would be a great research project in this area for a medical student, but in general I have yet to see a good outcome from herbal medication in pregnancy. Amelia's farewell party began with hotdogs and ended with pancakes; it was a sleepover. Only she decided it was still best to sleep at home! Even Meredith enjoyed playing with these girls and celebrating their friendship. She also ate 2 hotdogs. The following day was my theater (operating room) goodbye: cake, tea and mini-speeches from some staff. Muruka, the Kenyan OB resident, who I've spent a lot of time working with and teaching concluded his speech by saying, "I like that she is young." I added, "Yes, even younger than you." 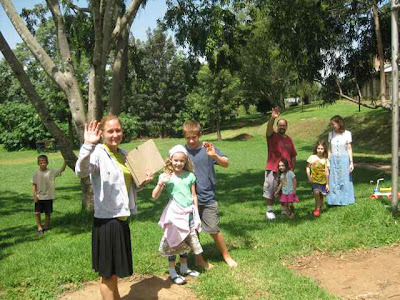 Sunday we will say,"Goodbye" in church and then with a soup/bread get together with the other long-term missionaries. I guess what I'm trying to say in all these "goodbyes" is that we've been really blessed by the community here. We've received encouragement from more experienced missionaries, we've shared challenges with the 2 other families that came the same week we did in November and been able to support one another, we've enjoyed the help from nurses, dental assistants, midwives, theater staff, and we've both taught and learned from our colleagues. It's not easy to be leaving. Thankfully we are only 3 hours away (2 hours once the road is fixed!) 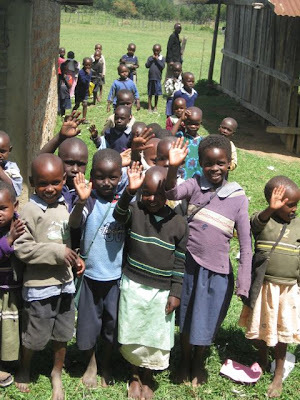 and many families here have older children at RVA (the school at Kijabe). Amelia will be able to start school immediately since it's year round. We did learn though that not only are the 2 American OB/GYNs leaving permanently, but the Kenyan OB will be taking about a year off starting July 3rd. This does leave me presently as the only Ob/Gyn. The hospital administrator is working on solutions, and please pray help is quickly found! Mamusi returned to our clinic 6 weeks after being attacked by a buffalo on the Mara. He sustained various lacerations to his face and a jaw fracture. 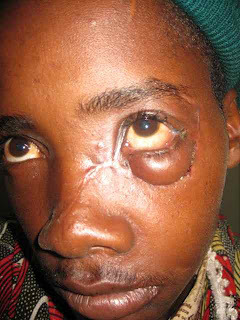 Myself and my Father-in Law (Opthamologist) attended to Mamusi immediately after the Buffalo Attack. Today we removed the wires from Mamusi's teeth and thankfully his jaw has healed quite well. Although, he has probably lost 25 pounds due to having his teeth fixated together for the past 6 weeks. (An experienced missionary surgeon here told me that tooth fixation use to be a treatment for obesity before bariatric surgery.) Mamusi has edema below his left eye and may need some further revisions. I think Mamusi was thankful for the treatment. When he left he cleared his mouth of debris by spitting on the floor of our front office. I guess he is used to life in the Bush. I didn't quite know how to respond.."You're welcome?" Tea and sugar, these were the gifts Janet suggested I bring to Roseline's funeral tomorrow. As Meredith and I walked-up to the dukas to purchase some sugar, she asked, "Why need sugar, Mommy?" I said, "Meredith, Roseline died and went to see Jesus we are getting the sugar for her family." So as we continued walking, she greeted every person saying, "Roseline died, it sad, we get sugar for her daughter." 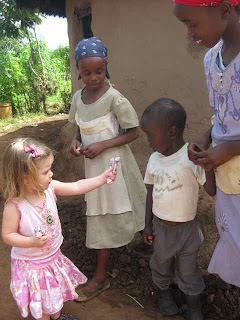 Once we bought the sugar she insisted on carrying it the entire way home saying, "I give this to Diana (Roseline's daughter)." As I was making a poster today for the funeral I read Ps 16:11, "You have made known to me the path of life; you will fill me with joy in your presence, with eternal pleasures at your right hand." Sweet, warm things bring pleasure, so tea and sugar are indeed the perfect reminders of the eternal joy that awaits us in heaven. 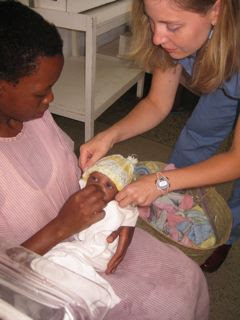 Thank you to all at Westminster Presbyterian who lovingly made baby hats for the NICU. Also a big thank you to Laurel for getting these hats shipped. The mothers were grateful and the little ones now warm. As you can see from the pictures we have some babies that barely make 2 pounds. 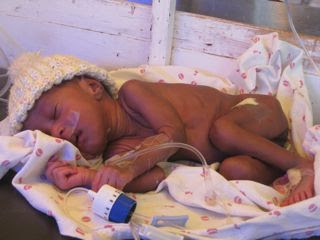 Mothers are required to come every 3 hours to feed, bathe and change their newborn. So me do this for 2-3 months while their little one grows. We previously gave out about 40 hats, then today another 40, and the nurse in charge will distribute the rest, whic h I think totals over 200 hats! What a blessing to these young lives and their exhausted mothers. I wish those of you who made hats could've been there! Again, thanks. 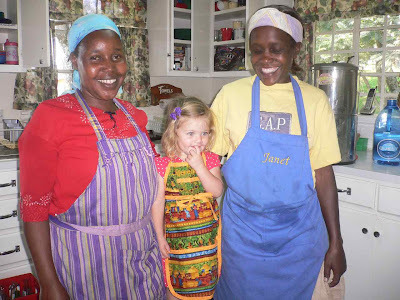 When we moved into our current place we inherited a house helper called Rosalyn. We had heard she was wonderful with children, kind, and hard working. However, during that month she sat around most of the time, seemingly to have no energy for any thing that we asked of here. Soon, it became clear she was sick. We offered to pay for her to go to the hospital and initially she refused. 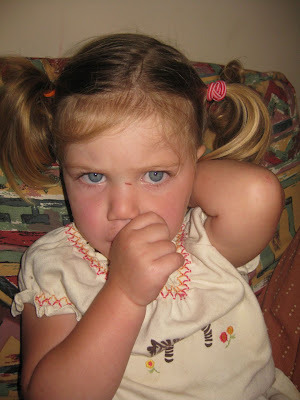 When she finally went, she needed 2 weeks of antibiotics to treat the meningitis. She also needed a CAT scan which revealed multiple brain masses. After looking at the scan I suspected lymphoma of the brain which has a 3 month life expectancy. This Saturday Rosalyn died. Knowing she loved Jesus, we rejoice for her life. 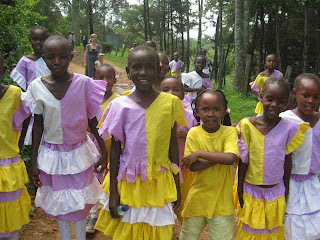 However, her daughter is now orphaned and only in primary school. 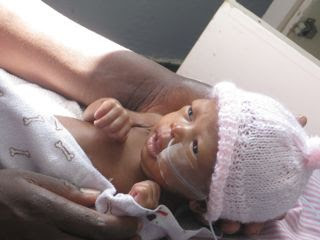 Please pray as friends and family decide how best to care for this little girl. Amelia is almost six years old. At times she seems grown-up like when she calls us on the phone at Tenwek to ask "Can I play at Anna's house, " or when she Skypes her grandparents by herself. Amelia has also figured out recently, "Dad I know who Santa Claus and the Tooth Fairy are, they are really your parents." But then I realize she is still a kid as I saw her "walking down to our house calmly carrying a newspaper size slice of windshield glass." Stop! Amelia now combs her own hair, picks out her own outfits, and is still working on reading. 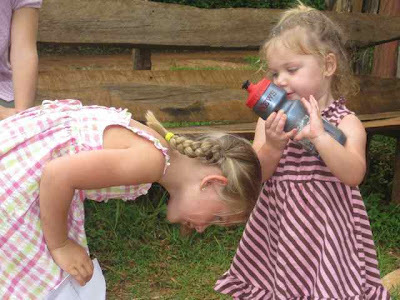 She is very fond of living in Africa and inseparable with her MK friends. Meredith is 2.5 years old. Her favorite things now are blankee, pockets, band-aids and the game Pop Beads. She loves to wear many different pairs of shoes each day, especially shoes that are not her own. She has stopped calling Amelia Sister and now say's, Ameeeeia. She is still a good sleeper and napper in her bed net covered crib. Meredith follows Amelia most places she goes..and has thankfully ended her biting phase. Meredith favorite thing of all is still her thumb. "His goodness shines like the morning, when the darkness runs from the day. Like the rising sun, His mercies chase the shadows away." What a relief and a praise to see all 3 critical patients from yesterday doing well this morning. Perhaps tonight, I will finally sleep well, although good sleep will probably have to wait until Saturday since I'm on-call. After waking up at 3am last night for no apparent reason, I was worried about being tired during the 9 cases scheduled for today. I had requested an early start and thankfully had the assistance of a surgical resident, a family practice resident, and a ob/gyn resident who are all on the Ob/Gyn service now. The first patient began as scheduled, only this patient was 7. It's rare, but ovarian cancer can occur at this age, and she had a large mass suspicious for cancer. When we looked inside the tumor invaded several other organs; with the help of the surgical resident (Agneta who has a particular interest and knowledge of pediatric surgery) we removed all visible cancer. After that I proceeded with 2 other surgeries, right as I finished and came home for lunch I was pager 999 (Kenyan equivalent to 911). Running back up to the hospital I met an unconscious mother who delivered at home 5 hours prior with retained placenta. She had a thready pulse and no blood pressure. The OB nursing staff quickly helped as I asked for IVs, epinephrine, pitocin, cytotec, blood, oxygen, a heater, packing, and face mask. As we started the 3rd IV line the fluid coming out of her vein was consistent with saline. Thankfully she came with 3 people all of which we sent to the lab to donate blood. After 3 units of blood, 5 liters of NS, and prayer she began to wake-up and was transferred to the ICU. As I was writing her orders Agneta came to tell me that the 2nd woman we had operated on was hypotensive and tachycardic. On exam it was clear she was bleeding inside. We rushed back to the OR, no more blood was available because I had just given it to the post-partum mother, Agneta suggested that we use the cell saver. I found it near miraculous that Tenwek had a cellsaver (a device to autotransfuse this woman with the blood in her abdomen) and even more so that they got it working in 5 minutes. We were able to stabilize this woman, but she is now also in the ICU. Things don't always work here (okay most of the time, things feel very inefficient to me). But today, 3 lives were saved thanks to a lot of people. The team worked well. As I reflect on the exhaustion I feel deep gratitude to the staff at Tenwek. Now, I ask God to bring healing to these lives and to protect them from further complications. Janet invited our family to her house for Lunch on Monday. Monday was Maharaka Day (Kenya's Independence Day from the British). The walk turned into a 2 hour adventure. After two stream crossings, a climb up a steep gully, a rest for the girls to cool off, stoppint to ask for directions we found Janet's house. 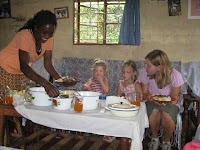 We enjoyed a typical Kenyan meal of rice, beans, meat, Mendazi, and Chai with Janet's family. Afterwards we walked through their garden and the girls watched Richard milk his two Cows. Then a long walk back home. Thanks to the many women at Westminster Presbyterian Church who designed, organized and created a cookbook. While I have no doubt that this cook book contains many wonderful recipes having eaten at many of these women's homes, purchasing a cookbook also serves a wonderful purpose. All proceeds from this cook book are going to develop a fund for woman who lose their child during childbirth. Let me share a few stories illustrating these woman's lives. Chepkorir labored at home for 48 hours, when her husband finally arranged transport for her to the hospital the baby had already died. Her husband, did not want to pay her bill because the baby had died, so she sat at the hospital for 1 month until finally she was released with her debt. Chepngetich came as a referral from another hospital where she had been for the past 3 days laboring, by the time she was sent it was too late for her baby. She said, "I go home empty handed, no child, and my husband who knows what will happen." 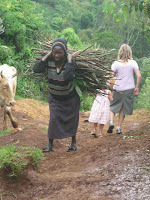 Chebet's baby already had passed when she came to Tenwek after laboring days at home. 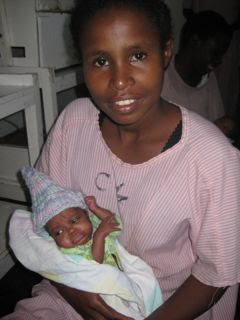 The obstructed labor caused a fistula to develop, so that now she leaks urine continuously. Currently, any woman who's pregnancy ends in stillbirth receive pastoral counseling. But each of these women also had different physical needs, some of which money could help. Money for incontinence pads and eventual surgery, for funerals for their children, for part of their hospital bill, for vitamins, and for transportation home. These gifts to grieving women tangibly express God's love for them. I wanted to share an excerpt from the book "Searching for God Knows what" by Donald Miller. Its a good reminder on the importance of liking to be with people particularly for those that may be natural introverts. "The most comforting characteristic of Chist is that He like people. Were somebody to begin a religious system...They would write a book the way Muhammad did. This would be the most logical way to communicate new ideas. Writing in scrolls was not something that interested Jesus. He never sat down and wrote a Mission Statement. Instead, he accumulated friends, and allowed them to write about Him, talk about Him, testify about Him. Each of the Gospels reveals a Christ who ate with people, attended parties, prayed with people, traveled with people, and worked with people. I can't imagine He would do this unless He actually like people and cared about them. Jesus built our faith system entirely on relationships, forgoing marketing efforts and spins. When asked what is the greatest commandment, Jesus replies that it is to love the Father, a relational exploit. He adds to love as well our neighbor. Christ is saying that the two most important commandments of God are to have in us a relational commitment to God and to other people." If we look back on the different phases of our lives naturally their are ups and downs. In my own life times of fulfillment are not associated with money, accomplishments, careers, or security. Instead times of fulfillment seem to correlate with the strength and richness of relationships in my life; my marriage, my relationships with my children, my extended family, my church and my friends..and of course my relationship with God. We should be encouraged here and now to invest in these things.